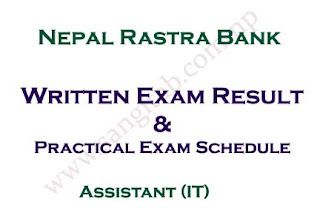 Nepal Rastra Bank published the result of written exam of Assistant (IT) and practical exam date, time & center also. The Written Exam was held by Lok Sewa Aayog on 2075/03/22. Practical exam Date: 2075/07/09, Time: 2:30 PM and Center: Nepal Rastra Bank Center Office, Baluwatar.